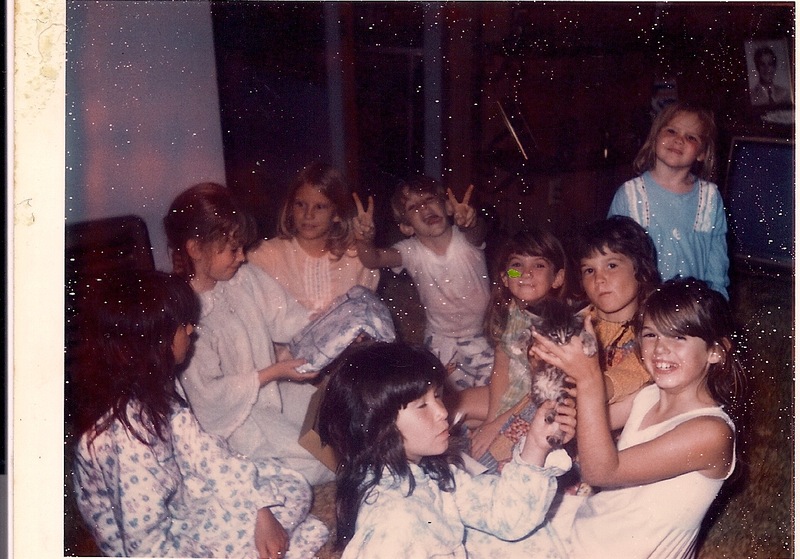 Growing up, my sisters and I seemed to celebrate every holiday, birthday and end of the school year with a slumber party. We invited all the cousins and then we could each invite another friend, which added up to about a dozen dozing bodies plastered across the living room floor and an honorary Sainthood nomination for my mom. The slumber party for my 9th birthday. Notice my brother Michael hamming it up in the middle. My daughters started having their own slumber parties over ten years ago when Emily was in kindergarten. But it’s my 11-year old Mary who has turned our slumber parties into the Valley Village equivalent of an Oscar party, with nearly 20 girls participating. Whether her friends are playing toilet paper bride (where the girls split up into groups and create the most elaborate wedding gown out of toilet paper), piggly wiggly (a game where you try to guess who’s hiding in which sleeping bag) or Chubby Bunny (where you cram as many marshmallows into your mouth as possible at one time and still audibly utter the words “Chubby Bunny” without choking or vomiting), Mary and her friends have just celebrated their eighth year of slumber party gatherings, and the events keep rising to new heights. 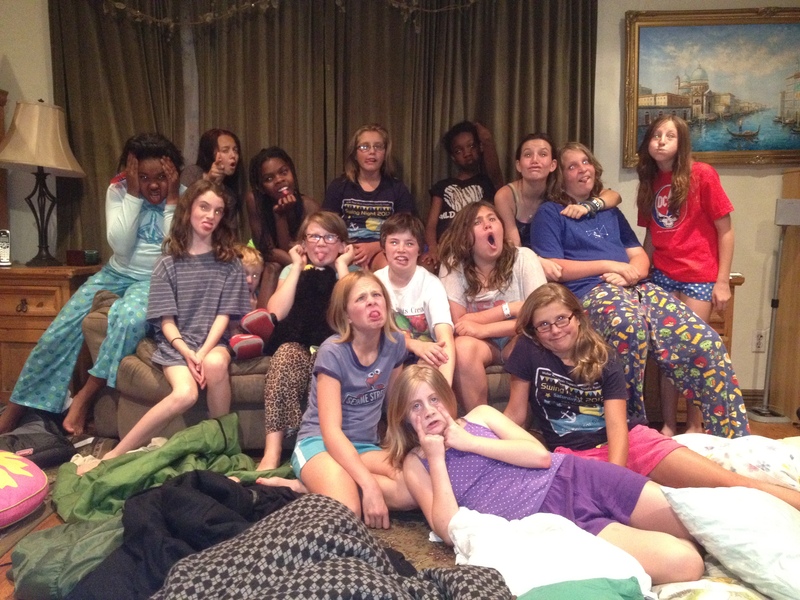 Last Saturday night we had 17 middle school girls and one boy over for a Colfax reunion slumber party (the lone boy did not sleep over), and Emily had an additional two high school girls in her room. Because I’ve been doing this for a number of years, I decided to compile a list for the parents who are slumber party novices in the hopes that one day, they too will become as demented as I am. 1. Know your limits. Just because your daughter’s friend’s super soccer mom can wrangle two dozen girls at a time, it doesn’t mean you can do it without turning into a psycho killer. Start out easy – perhaps three to five girls at a time and build from that. 2. Unless you can invite every single girl in the group, keep the slumber party on the QT. As an adult, it’s devastating to find out that everyone was invited to a party but you. It’s ten times as devastating for a tween. Tell the girls not to talk about the party beforehand. With Facebook and Twitter, everyone will know afterwards, but then they’ll have a couple extra days to try and grow a thicker skin. 3. Warn neighbors in advance that you’ll be having a slumber party. Tell them that the karaoke contest will end by 10:00 pm and stick to it. Unless it’s a particularly quiet group, don’t host a slumber party in a backyard tent unless you want to be treated to a late night visit from your local police. 4. Audition potential slumber party guests with a short play date in advance and then don’t invite anyone who is high maintenance. This means anyone who is rude, a picky eater, a whiner, a crier, a tattler, or a girl who always complains about a tummy ache. 5. Announce the rules in advance and repeat them as needed: Be nice. No one gets left out. For hide and seek, the garage and refrigerator are off limits. Anyone who uses the “B” Word (bored) gets to scrub my toilet. Then we’ll see how bored they are. No drawing on each other’s faces with a sharpie while they’re sleeping or putting their hands in warm water to try to get them to pee, or sticking their bra in the freezer (yes – I did it all as a kid so I know everyone’s tricks). 6. Make sure to have a phone number where parents can be reached at all times and tell them to keep their phone on. Have them set it on vibrate if they’re on a date night at the movies. Warn them in advance that if their little darling becomes too high maintenance, they will receive a call at any moment for them to come and pick her up – even if it is 4 in the morning. Most parents will laugh and think you’re kidding. Make sure they know that you’re not. I once had three parents drive up to my house at midnight because their kids were convinced that a slumber party meant that they were staying up all night. I let them know that they were welcome to stay up all night – in their own beds. 7. Keep the food cheap and simple.Uncooked pepperoni pizza from Costco is best. Pop it in your oven, and slice it into small pieces. When it’s halfway gone get a show of hands as to how many more pieces the girls will be eating and pop another in the oven. Tell the vegetarians to pick off the pepperoni. Ask anyone with a food allergy to bring their own meal and offer to reheat it. The last thing a slumber party mom has time for is acting as a short order cook. Serve grapes, cut up a watermelon and serve make-your-own sundaes with toppings prepared in advance in paper cups. For breakfast, slice Costco muffins into quarters or heat up Poptarts. For our party we paraded down the street to Yum Yum Donuts the next morning and every girl ordered her choice of donut. 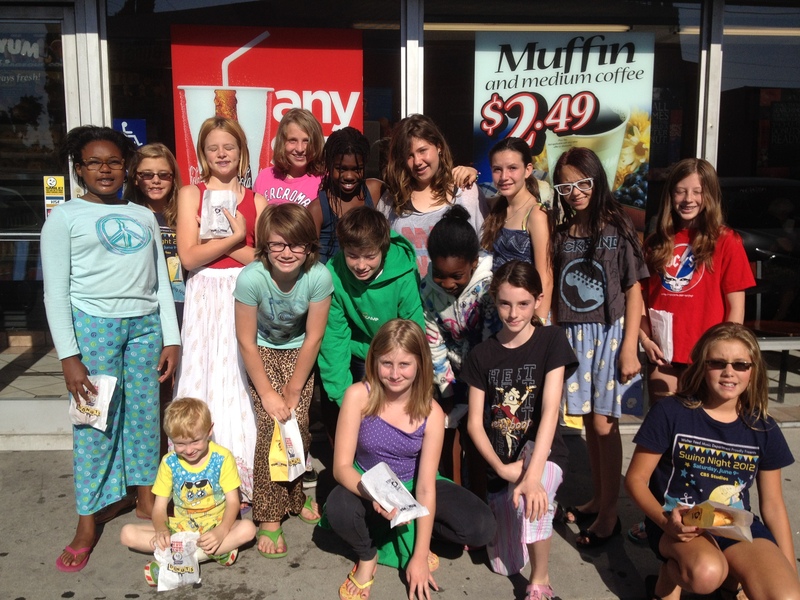 Slumber party aftermath – a trip to Yum Yum Donuts. 8. Make the girls clean up their own messes. Just because you’re not their short order cook, it doesn’t mean that you want to be their maid. This means clearing their food after meals, hanging up wet suit and towels if they’re swimming, and not spreading their bags all over the floor. 9. Use disposable plates, cups, napkins and utensils. I know it adds to my carbon footprint, but it seems like the better alternative to wasting 5,000 gallons of water in the dishwasher and risking all my dishes being broken. Label drink cups with girls’ names and keep all drinks outside or in the kitchen. Otherwise you’re liable to have apple juice poured in a sleeping bag and ants you’ll never get rid of. 10. Don’t serve sodas. There’s no nutritional value, you’ll have a lot of half-filled cups floating around, and for large slumber parties, caffeine is only your friend if it’s in your body. I prepare a 5-gallon jug of Crystal Light punch and have a gallon of juice and milk available. Or they can always drink water. 11. Get used to the noise. The larger the party, the bigger the wall of sound. The girls are having a good time, and unless you hear the cries of actual pain, you might as well accept that it’s going to be noisy. Think about wearing earplugs. And stocking up on Advil. 12. No cell phones. Girls don’t need to be texting other friends about what they’re not doing with these friends because they’re too busy texting. They can post an occasional photo to Facebook, but if a girl has her face glued to her iPhone, take it away until morning. If she refuses, see Rules #5 and #6. 13. Have some inexpensive activities in mind to keep the girls occupied: karaoke with a bunch of Glee DVDs; hide and seek; a board game like Apples to Apples; watching a recently released or classic movie. The very best is to have a pool. 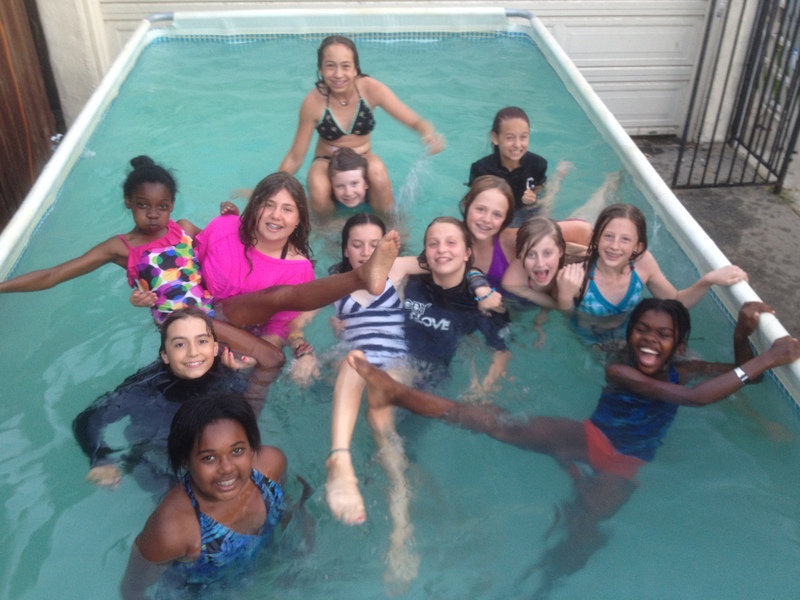 If you have a house and host a lot of slumber parties like we do, it might be worth it to invest in an above-ground pool. After just two summers it ends up being a lot cheaper than paying for a laser tag or theme park party every year. 14. Rearrange the furniture so the girls can sleep on rugs in the middle of the living room. If they start fighting over who gets to sleep on the couch, give it to the girl who is most low maintenance. 15. Give a countdown to lights out time. Tell the girls put on their pajamas, lay out their sleeping bags, pillows, and brush their teeth at least a half hour beforehand. Five minutes before, let them have a drink of water, but keep the water in the kitchen. Then turn out the lights and let them get settled. If anyone is afraid of the dark, keep a light on in another room for a few minutes, then turn it out once they’re asleep. 16. After two warnings to be quiet, grab a pillow and blanket and go sleep with the girls. The last thing a chatty girl wants is for a mom to be overhearing what she’s ranting about. However, once they start hitting the tween years, let them stay up as late as they want – with a warning to both them and their parents: their mood the next day will worsen in proportion to how late they stayed up. 17. In the morning, have girls put everything that’s theirs into their own pile in a corner or against the wall. Anything left over on the floor needs to be put away. Not by you. 18. About 20 minutes before pick up, search the house and yard for anything that doesn’t look familiar. Set it in the center of the room and make sure everything goes away. If you find something unfamiliar after the party’s over, take a picture of it, or rather them – despite your best efforts, you’re sure to have a lot of lost & found items. Send one email to all the parents and attach the photo. 19. Make sure your kid does the clean up after the party. If she’s reluctant, let her know that it’s the last slumber party she’ll ever have. And stick to it. You may end up really crossing your fingers that she refuses and you never have to go through this again. 20. Keep this list where you can find it easily for the next party. Unless your daughter doesn’t follow rule #19. Then you can chuck it along with the rest of the mess you’ll be cleaning up. Your daughter is young for such a short period of time. A slumber party is a great way to share lifetime memories, develop deeper friendships, and earn the gratitude and admiration of all the other parents who are much too sane to venture into such lunacy. I did not have slumber parties or sleepovers very often when I was a kid. If I did, I doubt they would as big the ones Mary and Emily have had. I am glad that all I have to do is allow these parties to take place. Although I don’t think I ever get asked, the topics are presented to me as “Mary is having a slumber party on such and such date.” Not really asking for approval, but more of a warning. My favorite one was when I was never told at all. I was sitting on the couch and I looked out our front window. I saw a bunch of girls walking up to my house with sleeping bags. “Cathy, why are there a bunch of little girls with sleeping bags coming to our house,” I asked in a somewhat terrified and annoyed manner. Cathy says,” Oh, didn’t I tell you? Mary is having a slumber party.” Place explicative here. During these occasions I hide in my bedroom with my dogs. I think we should lower the threshold for rule number six. At 2:00am I am willing to call any parent to come pick up their kids if they don’t stop talking. Now all the parents that read your blog will be wondering if it is their little sweet heart that I am talking about. Muahaha (evil laugh). My tween and I love your list! 🙂 Thank you. You gave us many ideas. Our favorite is Chubby Bunny! I didn’t go to slumber parties a lot as a kid. I had birthday parties and stuff though, and a comment on the food: Getting cheese pizza is easier. The vegetarians don’t have to pick meat off (I find that pretty mean to be quite honest, like telling people with a peanut allergy to pick the nuts off something), and anyone who says cheese is boring is welcome to bring their own toppings next time. I agree! I’m a vegetarian teen and I just wouldn’t eat! Having our first slumber party tonight. I’m glad you linked back to this post from your Mom Olympics post because I’ve been meaning to find your rules and put them into practice tonight. Wish me luck! why bother? with such harsh rules it’s no fun at all. Sending girls home at midnight? Worst list I’ve ever read. Do you even have kids? Do they hate you? I know I would. I am a kid and I would to have these rules enforced at my house. My mom and dad would never do something like that! I would be so angry, what parent has these rules! I would hate to have these rules enforced at my house. I got a lot out of this, thanks! Listen, I like the idea of slumber parties, and I understand that with slumber parties as big as the ones your kids have their has to be rules. But your kids’ friends might not want to come round again with all those rules. The worst advice ever!! You should be listed as 20 things not to do or do this if you want to be your daughters last summer party!! I’m in the same situation as you, I think these rules could get kinda harsh, but they are really useful. Worst advice ever… I’m surprised that your kids even want to have sleepovers with all of these stupid rules. GOD….. if I was that ladies daughter I would want to kill myself!!! Hate her!! Why not have some fun you don’t have to be so strict! You only live once do you want that life to be boring? NO! Have fun for once.